The diverse arrays of proteins secreted by senescent cells have been described to influence aging and to have both pro-tumorigenic and anti-tumorigenic influences on the surrounding microenvironment. Further characterization of these proteins, known as the senescence-associated secretory phenotype (SASP), and their regulators is required to understand and further manipulate such activities. The use of high-throughput technology allows us to obtain visual and quantitative data on a large number of samples quickly and easily. Not only is this an invaluable tool for conducting large-scale RNAi or compound screenings, but also allows rapid validation of candidates of interest. 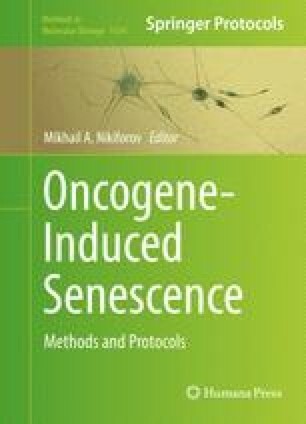 Here, we describe how we use the Widefield High-Content Analysis Systems to characterize the phenotypes of cells following modulation by potential regulators of Oncogene-Induced Senescence (OIS) by measuring numerous markers of senescence, including the SASP. This approach can be also used to screen for siRNA able to perturb the expression of SASP components during OIS.